Scott Brinker has a great article on the role of marketing in a semantic Web world. This is a very valid question, since the semantic Web world will IMO mark the end of the “destination” Web and the advent of the “me” Web: I don’t need to go to any Web site to get my information, it gets instead aggregated and filtered out of the junk I don’t want to see in the format I enjoy to consume it the most, one of the filters being the reputation I have of the author of the content as weighted by each member of my social network. I agree with Scott that good semantic marketing will start with good, and accurate data and metadata about products/services, good distribution in particular via compliance with various established publication standards (microformats, RDFa, etc.). If I’m correct on how data relevancy will be established by leveraging your social network, SEO will essentially become the old name for “Reputation Engineering” or “Reputation Hacking”. The more reputation your company has in a given social network, the more it will top query results. Contextual ads next to the content/data my collection of queries is typically retrieving. This is similar to the ads you have in Google Reader. Suggestions (similar to Google Suggests) as I’m creating my query in my semantic query builder, companies pay for certain categories of products or names to show up higher in the list (imagine a Google Suggests where companies can bid to push words higher in the list of suggested items). Looking at the daily Google hot trends today, I noticed a social money service called Upromise. 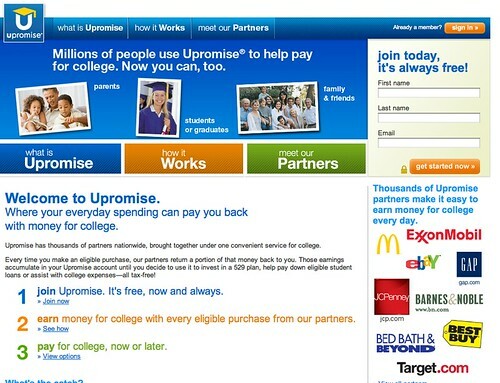 Upromise is marketed as a way to save money for your kids’ education. It is a subsidiary of SLM Corporation (“Sallie Mae”), the U.S. largest student loans company. You essentially save by spending. You get “1-25% back from eligible purchases from 600 online retailers”, “8% back from participating restaurants”, “1-3% on select items at grocery/drugstore”, “10% EXTRA on select items at participating grocery/drugstore and at Upromise dining restaurants; and 1% everywhere you shop when using the Citi Upromise World MasterCard”. For online transactions, you have to start shopping at participating shops from the Upromise.com Web site (so that they can track your purchases) and for offline transactions, you have to register your existing Credit/Debit card or grocery/drugstore store loyalty card to your UPromise account, and Upromise uses this information to track your purchases and match them up with cash rewards from participating merchants. The privacy notice mentions that some programs might require additional information like Frequent Flyers mile numbers or telephone number. Other members can be linked to the account, which makes the contributions from family and friends possible. For restaurant cash rewards, Upomise use Restaurant Cashback. The service is essentially a compromise on privacy for value. I find the promise on rewards very high (“up to 25% on select items”) and would be curious to hear from people who have used the service. I personally find the idea of “saving by spending” a bit ironic. I would imagine that people would save much more by not going to the restaurant in the first place or not buying that brand product and instead buying the white label product. But I can see that in some cases, the system works: for instance, cash-rich retired grand parents who, for good reasons, might want to enjoy brand products or nice restaurants, while helping their kids and grand-kids out. In short, I’m really curious to hear from real participants with real success stories of having saved a significant portion of a student loan via this program. I see more opportunity in smart savings programs built into Web services like Wesabe or Mint.com. For instance, assuming you’ve been to a restaurant several times you would see a message that would help visualize how much this money could represent by the time your kid gets in college, if you hadn’t been to this restaurant, or at the very least, if you had chosen a cheaper alternative nearby. The reason, according to Kevin Kelly most excellent article Better than Free: embodiment. Embodying the book in the form of a lightweight, low-power long-lasting reading device is something I value more than the content itself.